This is the first wide-ranging and accessible introduction to the fascinating subject of the New Age movement. Paul Heelas is Director of the Centre for Study of Cultural Values and Reader in Religion and Modernity in the Department of Religious Studies at Lancaster University. Appendices: (1) Characterizations of the New Age; (2) Before and After Exegesis. It should be clear from all of this that Heelas takes the New Age seriously and is able to point to it as cultural expression of modernity as well as, in some ways, a resource for modernity. Voices are often shrill and unidimensional in dealing with the New Ages; so his careful, searching judgements are surely welcome... 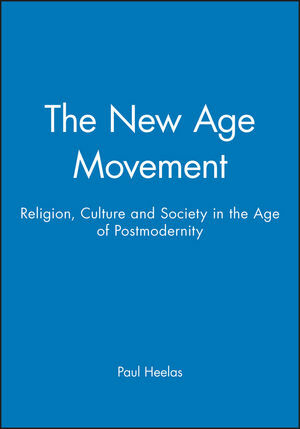 Still, Heelas has contributed significantly to the small list of truly good books on the New Age movement. With its plethora of concrete examples, his work is rich in conveying the texture of the movement, and it is evenhanded in its evaluation of evidence and claims" Professor Catherine L. Albanese, Department of Religious Studies, University of California. "Paul Heelas has produced an extremely useful account of the new Age and this book will no doubt be a standard text for some time to come." Fiona Bowie, BASR Bulletin. * The first wide ranging and accessible introduction to this topic. * Draws on a wide range of examples (European and American). * One of the first books to take account of the considerable body of literature (in social theory and cultural studies) which has been developed in connection with modernity and postmodernity.